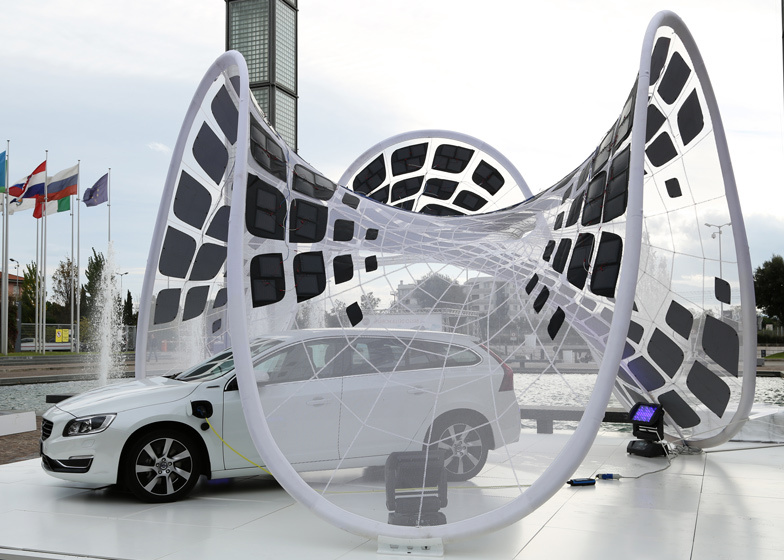 This tensile pavilion is covered in solar panels that can be used to charge an electric car and then folded up to fit in its boot (+ slideshow). 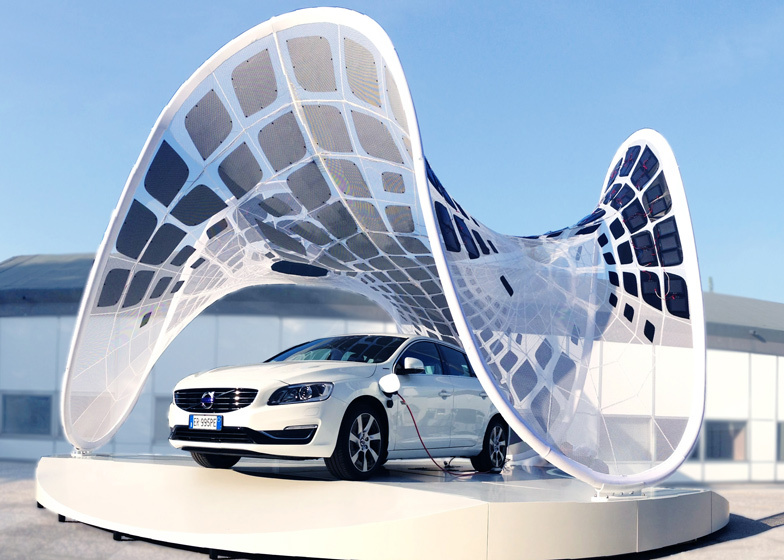 Los Angeles office Synthesis Design + Architecture created the pavilion for car brand Volvo to showcase its new electric hybrid V60 car during a promotional tour of Italy. The design was the winning entry to a competition seeking an iconic and portable pavilion, and the architects have described it as "essentially the first-of-its-kind portable charging station for a hybrid car." "We wanted to challenge the notion of solar power as something that is an additive piece of engineering infrastructure," said Synthesis founder and principal, Alvin Huang. "The solar panels became a design feature and design driver, rather than something applied after the fact." A total of 252 flexible photovoltaic panels attached to the lightweight fabric surface have been arranged in a pattern that optimises their exposure to the sun, based on the average annual position for any location in Italy. As the sun moves across the sky, the panels that are collecting least energy are automatically turned off to ensure maximum power generation, whatever the pavilion's location. Power produced by the panels is fed through wiring integrated into the seams of the fabric skin into a portable battery that charges the car. The pavilion's CNC-bent aluminium frame is constructed from 24 sections and covered in a tensioned skin made from a vinyl encapsulated polyester mesh membrane. The frame can be collapsed and wrapped in the membrane for transportation and can be erected or dismantled by two to three people in less than an hour. "Pure Tension is an experimental structure that, similar to a concept car, is a working prototype that speculates on the potential future of personal mobility and alternative energy sources for transportation while also exploring digital design methodologies and innovative structural solutions," the architects added. 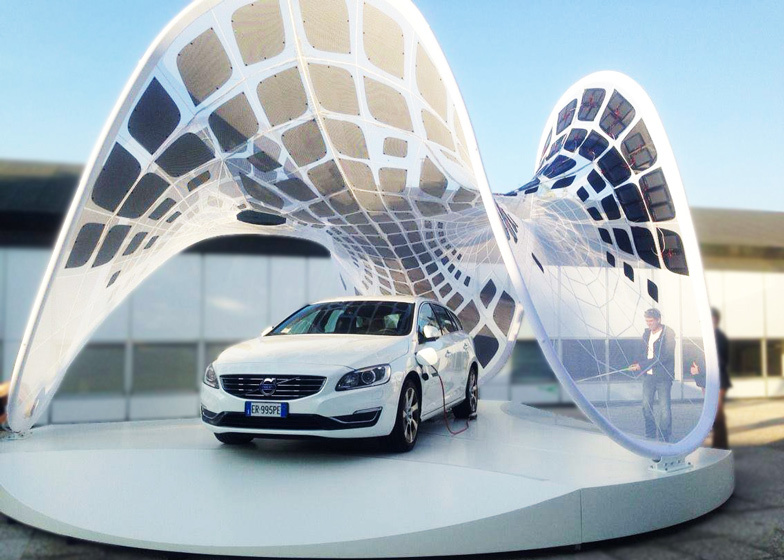 Volvo Italy’s quest for a cutting-edge pavilion to showcase the new Volvo electric hybrid V60 was realized in Milan, Italy. 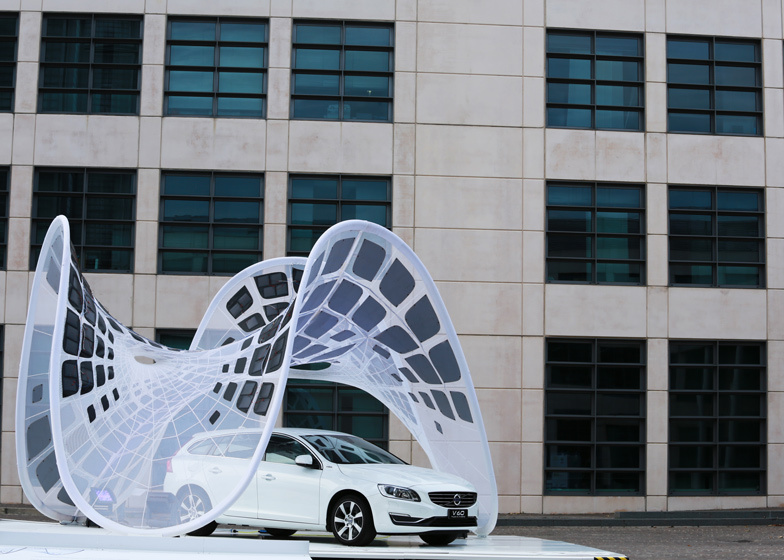 The high-tech solar pavilion, designed by Los Angeles-based Synthesis Design + Architecture, was the culmination of months of design refinement, research, and engineering after the firm won Volvo’s Pure Tension competition this past summer. 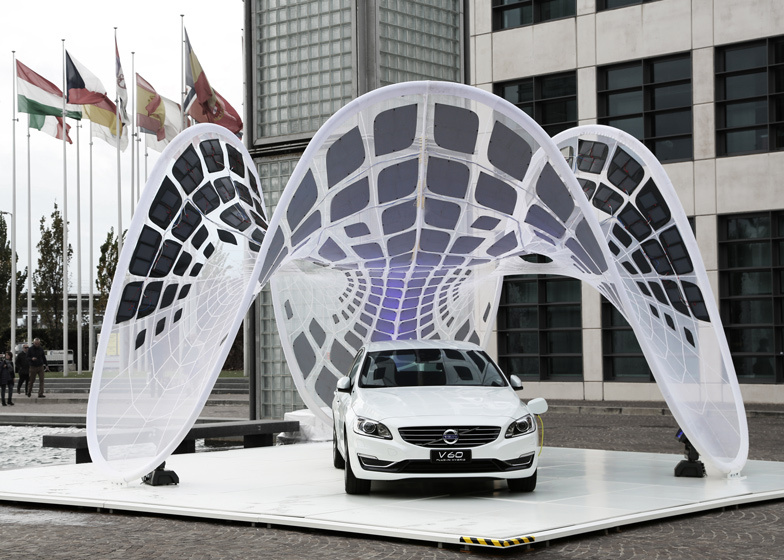 The striking pavilion is a portable, solar-powered tensile membrane structure for the new Volvo V60 plug-in hybrid electric car which not only charges the car but also flat-packs to fit in the trunk of the car and assembles in less than one hour. Digital design technologies have been harnessed not only to create an iconic design piece, but also a vision for the future of transportation. SDA won the international competition by fulfilling Volvo’s wishes for a portable, yet iconic structure to showcase their new plug-in hybrid on a press trip through Italy. However, SDA strategically added two key elements to the design that made it stand out: one was the lightweight fabric and aluminum structure that could be collapsed into the trunk of the vehicle and deployed by two people with ease, the second element was a photovoltaic skin that charges the vehicle, essentially the first-of-its-kind portable charging station for a hybrid car. “We wanted to challenge the notion of solar power as something that is an additive piece of engineering infrastructure,” says Synthesis founder and principal, Alvin Huang. “The solar panels became a design feature and design driver, rather than something applied after the fact. The goal was to balance utility with beauty,” he adds. The pavilion is the result of a global effort with design and engineering being carried out in Los Angeles by SDA with Buro Happold engineers, fabrication being done by Chicago-based Fabric Images, solar panels being sourced from Ascent Solar of Texas. The completed pavilion was then shipped to Italy to embark on a 9 month, multi-city promotional tour starting with the launch event hosted by Volvo in Milan. The next stop for the pavilion is the EcoMondo Trade Fair of Sustainable Material & Energy in November. Additional stops will be announced as they are confirmed. The tour will end at The Plan Magazine's annual Perspective event in Venice next summer, coinciding with the Venice Biennale. Pure Tension is an experimental structure that, similar to a concept car, is a working prototype that speculates on the potential future of personal mobility and alternative energy sources for transportation while also exploring digital design methodologies and innovative structural solutions. 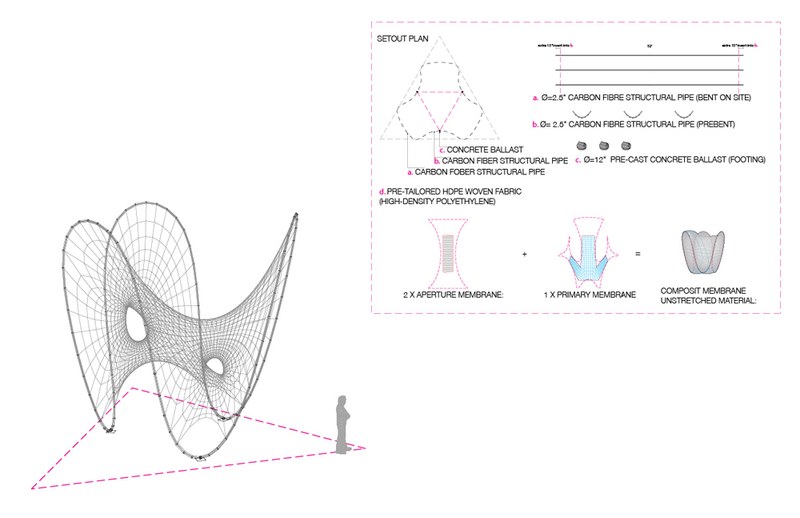 SDA derived the original design geometry through a conceptual form-finding process known as dynamic mesh relaxation. The mesh topology produced by SDA was then further developed by Buro Happold, who provided an engineered form-finding process that takes into account material properties to rationalize the contours. Engineering revealed that the SDA form-finding process was within 90-95% accurate with a maximum deviation of about 2 inches. The continuous tensioned skin of pavilion is articulated by three hierarchies of geometric pattern that collectively define the geometry and produce a visually engaging moiré effect. The perimeter frame of the structure is defined by a CNC bent aluminum pipe system with swaged slip fit connections, while the tensile membrane skin is materialized as a vinyl encapsulated polyester mesh membrane. The perimeter frame was rationalized from a free-form geometry to exactly five rational arcs enabling an efficient and cost effective fabrication strategy. It is manufactured in 24 parts, which along with the skin collapse neatly into two 65” x 15” x 15” ‘B-cases’. The membrane comes in two pieces with a zippered seam and spandex sleeves that wrap the aluminum frame. Collectively the pavilion weighs 150lbs in total and can be assembled and taken down in just under an hour by a team of two to three people. There are a total of 252 7"x7" lightweight flexible photovoltaic panels produced by Ascent Solar technologies embedded within an applied graphic pattern of vinyl tiles along the mesh. Since the pavilion will travel throughout Italy but the specific site and sun orientation are not known, this pattern is the result of intensive solar incidence analysis on the structure that found the average annual solar incidence of the skin for 360 degrees of orientation on any given site in Italy. The PV panels are placed in the areas of greatest average annual solar incidence. Despite the intensive solar analysis resultant pattern and multi-directional form of the pavilion places solar panels pointing in multiple directions, and solar arrays are only as powerful as their weakest link, To resolve this a MPPT (Maximum Power Point Transmission) controller is utilized to sample the output of the cells, and selectively disable those that are not collecting enough energy, thereby ensuring that the pavilion is receiving as much charge as possible in any given orientation. The target goal to achieve the minimum power required to charge the car was 300 watts of power. The current skin is testing at about 450 watts of power on optimum sun conditions. The wiring of the PV panels is integrated into the seams of the fabric and feed a portable battery system which in turn charges the Volvo V60. Current estimates have the pavilion recharging a fully depleted car battery in about 12 hours. 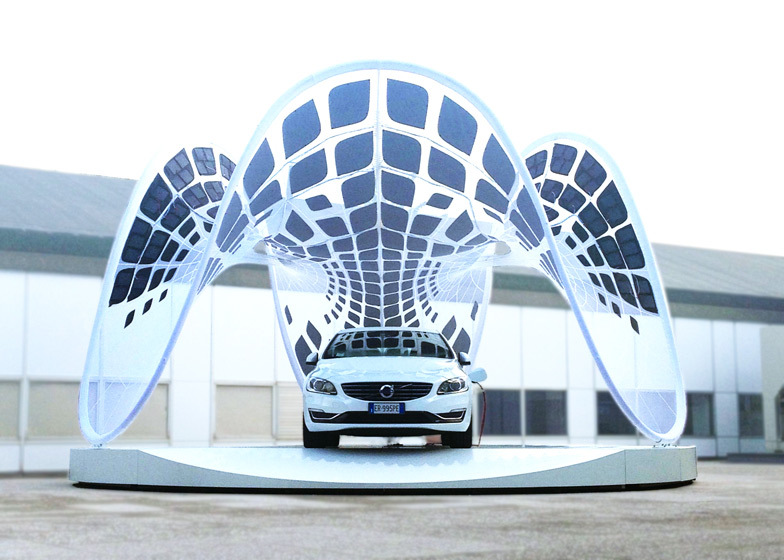 Technical requirements for the charging of the V60 were developed in collaboration with the Volvo Design Center in Camarillo, CA and solar consultant FTL Solar in New Jersey.